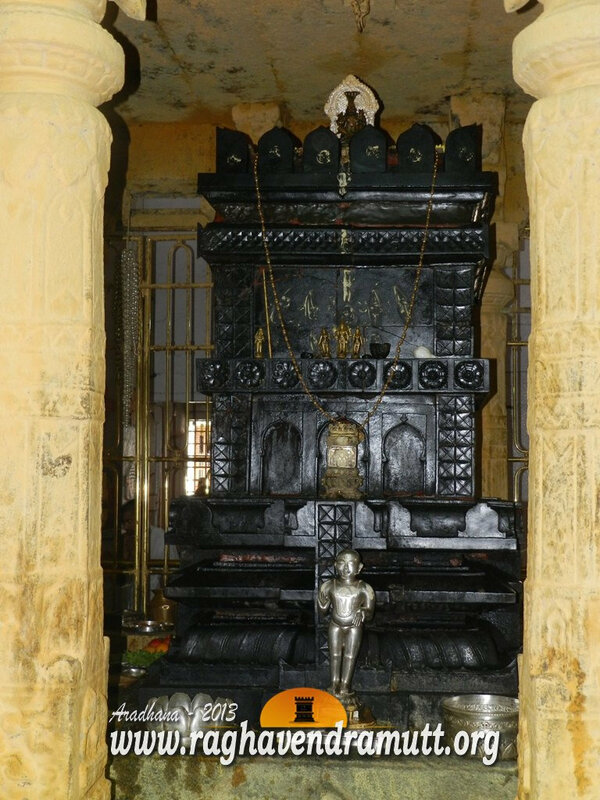 The last post had dealt with Muddukrishna or Krishna Avadoota who was an ardent devotee of Raghavendra Swamy. Another devotee whose mention brings before us the exemplary qualities of love, affection, devotion and selflessness is Krishnacharya who today is popularly known as Ibharamapura Appa. Ibharamapura or Ibharamapur (Some wrongly call it Ibrahmipur) is a small village which is located just two and half miles from Mantralaya. Today this place is revered all over the world for the extraordinary deeds of Krishnacharya or Ibharampura Appa and his steadfast devotion to Raghavendra Swamy or Rayaru. He was born due to the grace and blessings of Rayaru to Obalacharya and his wife in Ibharampura. One day, young Krishnacharya went away from his home to a deserted place and wept as he was scolded by his parents. An old man came and blessed him, saying that he would soon enlighten the world about the Mahime and Mahatme of Raghavendra Swamy. This old man was none other than Ashwathama, son of Dronacharya. Later, Krishnacharya grew up to be a scholar and soon became an ardent devotee of Rayaru. He was married to Krishna Bai and he affectionately called her Achaamma. He performed many miracles due to the grace of Rayaru and he always worshipped the saint of Mantralaya. Just as Appanacharya came everyday from Bichale to Mantralaya to get the darshan of Raghavendra, so also Krishnacharya came all the way from Ibharamapura to Mantralaya to get the darshan of Raghavendra Swamy. It is said that on the days Krishnacharya could not come to Manytralaya, Rayaru himself came to Ibharamapur and gave darshan to Krishnacharya. Soon, people began calling him Appa out of love and respect as he solved their problems and encouraged them to lead a holy life. People, irrespective of the creed and religion to which they belonged, flocked to Krishnacharya who by then was known as the miracle man of Ibharamapura. Another legend about Appa was that he always exuded fragrance and this remained even when he came in the dreams of his devotees. He was a master of Sudha Parimala and his discourses on it attracted hundreds of people. Many were the miracles he performed and Appa became a living legend. The then ruler of Mysore, Mumadi Krishnaraja Wodeyar, considered Appa to be his friend, philosopher and guide. Today, the small village of Ibharamapura, also has two Kattes. One of them is the Appa Katte and the other is the Achaamma Katte. Apart from the katte, the house where Appa lived still exists and his descendents are still living there. Appa breathed his last in Ibharamapura in 1869 and his wife died a few years later. Even today, the Aradhane of Appa is celebrated in a grand manner in Ibharamapura. It occurs during Shravana Shuda Pratipadya. The temple at Ibharamapura is open in the morning between 10 a. m., to 12 noon. To reach the village, you need to continue on the road going to busstand from Mantralaym SRS Matha and two kms away, you can see the board announcing the village. Take a left on the road here and travel further. There is no public transport to Ibharampura.